This exciting introduction to American government asks students to critically evaluate the quality of democracy in America today and to consider how underlying structural factors-such as the economy, society, and cultural values-affect and are affected by our political system. The Sixth Edition of this bestselling text has been completely updated through September 11, 2001, the war on terrorism, and the 2002 midterm elections. 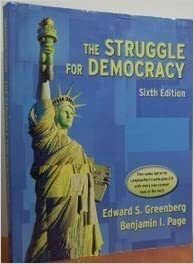 Continuing to offer a lively, critical thinking approach to the course, The Struggle for Democracy is organized around two themes: "Using the Democracy Standard" and "Using the Framework." The first theme, woven throughout the narrative, asks students to evaluate the health and vitality of American democracy today against a carefully defined democratic ideal. The text's second theme, "Using the Framework," asks students to look at the structures underlying our political system-the economy, society, cultural values, technology-and examine how these structures affect, and are affected by, our political system.